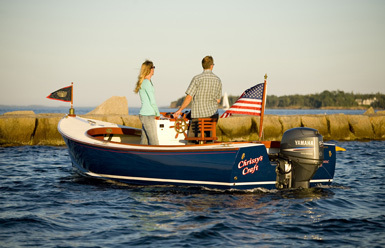 The classic lines of the West Pointer (available in 18' and 22' versions) are derived from sea-tested Maine skiffs. 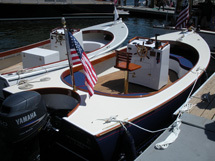 These designs have been plying the coast as work and pleasure boats since the beginning of the 20th century. The hull is pleasing to the eye and seaworthy. The classic hull form is constructed by laminating cedar veneers with epoxy creating a strong, lightweight boat that will stand the test of time. 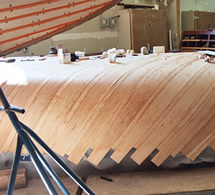 In keeping with Six River Marine's reputation as a custom boat builder, every hull is built to order. The owner may specify the cockpit layout and finish, or choose a standard configuration. The classic hull shape of the West Pointer, with its generous beam, easily gets on plane providing a dry and stable ride through a wide range of fuel efficient speeds. The basic specifications of the West Pointer 18 include an LOA of 18', 6", beam of 7', 6", draft of 10" (motor up) and displacement of 1,100 pounds. 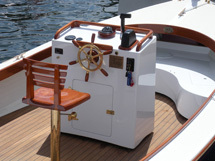 We recommend a 50-hp motor, which will provide an approximate speed of 28 knots. The hull is Coast Guard approved for 8 persons. A number of options are available so you can configure your West Pointer exactly the way you want it. Our West Pointer was based on the original design of Alton Wallace. 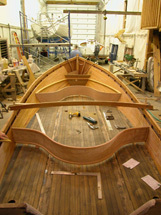 A number of years back when Chip was apprenticing in the boat building program at the Maine Maritime Museum, he contacted Alton and asked if he could take a look at the original boat and take a few basic measurements. Alton agreed. Chip then proceeded to carve a half model. 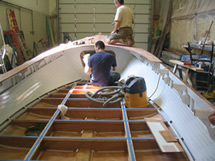 From the model, Chip and another apprentice built a hull using traditional plank on frame construction. This boat differs from Alton's design in that it has more freeboard, less flair, increased beam and increased length. 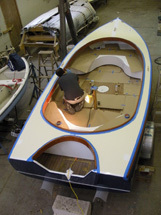 Before setting out to build the first Six River Marine West Pointer, it was decided that the cold-molded process would be a nice construction method to employ with this boat. Not only would it produce a boat that was lightweight and strong, it would also appeal to folks who desired ease of maintenance. 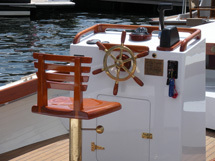 The photo's below show some of the construction details of our West Pointer 18. Click on an image to view a larger version. Building jig ready for planking. 1st layer of planking nearly complete. 1st layer of planking on the starboard side. Planking layer #1 on the port side. Spreading on epoxy for layer #2. 2nd layer on the starboard side under vacuum pressure. Starboard side ready for 3rd layer. Hull skin (3 layers) after removal from jig. Interior ready for floor timbers and stringers. Floor timber/stringer assembly built up. Sheer clamp,frames,floors and stringers expoxied in place. Glued ceiling adds strength and good looks. One of the crew varnishes the coaming on a new WP19. A new WP19 ready for interior components installation.